Pin It I looked in the market for zucchini blossoms all summer long, didn't find it. Now that it's already fall, I see a basket full of them! It doesn't matter, they are always welcome in my kitchen. I've never really seen them with the zucchini still attached to it (as I see in some pictures), every time I see the blossoms they have already been separated from the vegetable. Gently clean the flowers with a soft paper towel and remove the insides (the part that contains the pollen). Cut off the bottom and make a cut along the flower, so you can open . If you see a lot of pollen still in the insides, you can clean it with the paper as well. Cut in strips, not too small, it will wilt later. 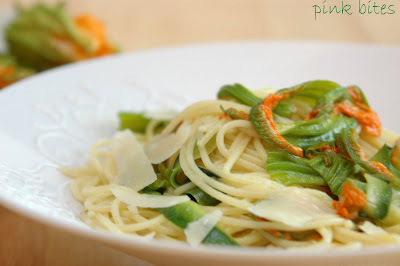 With a vegetable peeler, make ribbons from a small zucchini. 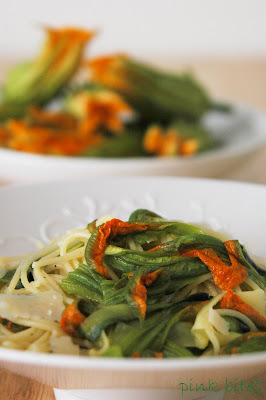 Cook chopped onions in olive oil until clear, add zucchini ribbons and flowers. Season with salt and pepper and cook for a few minutes over medium-low heat. Add cooked and drained pasta to the pan and gently toss to combine. Top it with Parmesan shavings. YUM!! Love the vibrance of the dish. 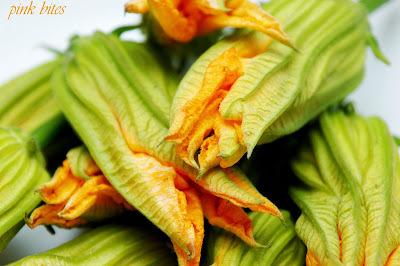 i have always wanted to make zucchini blossoms but never really knew what to do with them! Hi! Just found your blog through Closet Cooking and saw that you mentioned Brazil. I'm a US expat living in Maringa-PR. I love your blog. I hope to catch up on it more soon. That vegetable sandwich looks amazing! Tasty Trends - there is so much to do w these babies! I will soon post another recipe using the blossoms. Lori - Maringa??? I am from Londrina. What are the chances! Rita - I am not sure you will fond them in HK... I never saw them back in Brazil either. That's the beauty of traveling. precious pea - I can't believe you guys don't have zucchinis there! Well, I guess you probably have a bunch of veggies and fruits that I never heard of either.